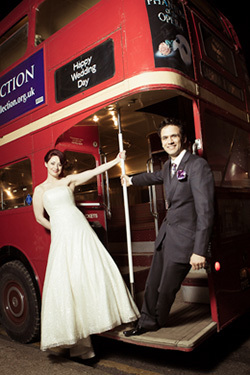 Hire a Routemaster Bus from rentaroutemaster.com and allow us to make your occasion truly memorable. Our team are proud and passionate about our buses and offer first class service to our customers. Our Red Buses have been beautifully restored to their original London Transport 1950’s and 1960’s condition of charm and character. A practical and very cost effective alternative to other forms of transport, the famous London Bus with it’s ‘hop on - hop off’ rear open platform is known throughout the world as one of the most iconic images of this Country and part of the London Capital’s Heritage. We can transport your party in one of these lovely historic buses to your chosen venue in fun and sociable style. We can provide a range of Red Routemaster Buses with either 64 seats on one of our original Routemasters or 72 seats on the later lengthened version. We can also provide a Routemaster with doors instead of the open platform that has 57 seats. In addition, we also have a Vintage AEC Regal IV Single Decker with 41 seats dating from 1952, before production of the Routemaster but styled by the same designer Douglas Scott. So no matter what the passenger numbers are, we can tailor our classic fleet of red buses to suit your requirements. There are endless possibilities; A Wedding or Civil Partnership, Birthday Party, School Prom, Works Outing, Sightseeing Trip. Christmas Lights etc. We can also cater for Corporate Hire and Filming. You may wish to incorporate your own ideas? We will endeavour to accommodate your requests. 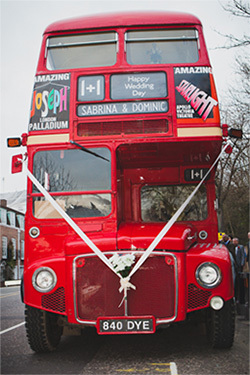 For your Wedding or Civil Partnership we will decorate your bus with Ribbons and Flowers and the rear open platform provides a fantastic stage for photographs of the happy couple. We can also arrange personalised destination blinds with your chosen names or wording. You may wish your guests to have a celebration drink as they board? We can organise all this and more. Our buses are always crewed by our friendly, smartly uniformed drivers and conductors who’s aim is to make your day as special and enjoyable as you imagine it to be. The iconic Red London Bus never fails to manifest attention and adds to the spirit of the day! Hop onboard and Rent a Routemaster!